Your perception works like magic, and can do miracles. It is everything that we perceive with our senses and feel. We see, touch, observe and then let our surroundings affect us. And yet it is surprising at the same time that, how we don’t even pay attention to how things affect us. These are just the most common things that we observe daily. But our perception is far a broader concept than just providing ‘input’ to our mind. It almost controls us, changes our mindset and it contributes to our own formation. I don’t know whether you notice such things or don’t. But I have personally observed the game of our perception. It has the potential to change our life by just staying in the background like an insignificant character. There are many other things that we observe daily, common and odd ones. These are actually the outcomes of the perception of those people and even us. Rest of it depends on the fact that how wisely you use it, and you are wise enough to know it. Conclusion: We are created by whatever we perceive. If we pay a little heed towards our perception, then our life will become more simple and beautiful. Unknowingly we create our own world by whatever we perceive. 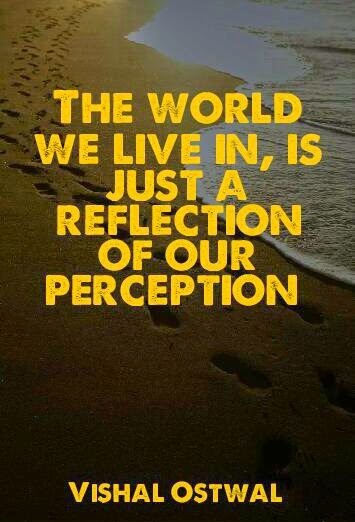 This world is just a reflection of our perception.